since we graduated from high school??? OCTOBER 12, 2019, 5:00 TO ?? We'll have more to say on the subject, besides letting you know there's NOT AN OHIO STATE GAME ON THAT DATE (WE CHECKED). Will fill you in on details as they firm up. 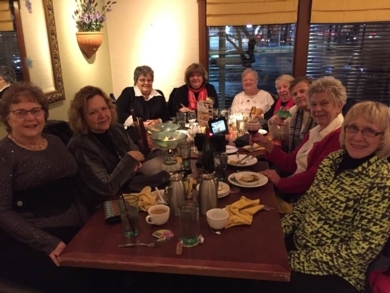 Here are the Ladies of ‘64 enjoying one of our monthly dinners at the Olive Garden in Heath. We always have a great time! We always meet at 6:00 p.m. the second Tuesday of each month. Our next meeting will be at 6:00 on Tuesday, March 12, 2019 . Let us know if you’ll be coming — or just show up! Men, you are welcome too!